This Chocolate Chip Pie is the easiest pie in the world to make! It is a cross between a chocolate chip cookie and a pie. To make this, you can prepare everything in one bowl, no electric mixer needed. Just mix all the ingredients together and pour into a store-bought pie crust. The only thing that takes a while, is waiting for the pie to bake: it takes about 1 hour! Then enjoy and top with vanilla ice cream. My mom got this recipe from a lady in her quilting class. This was one of the first desserts I made for my college friends at our weekly dinner parties. Enjoy!!! 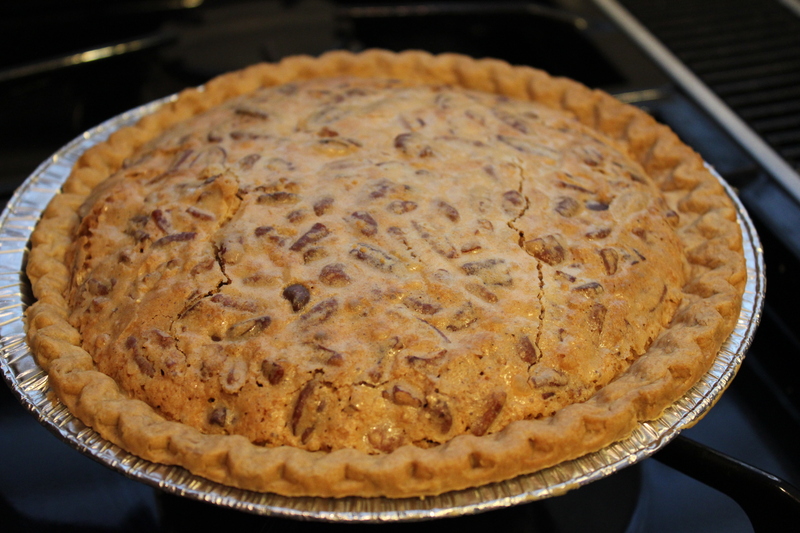 When butter has cooled down a bit, add the chocolate chips and pecans. Fold to combine and pour batter into unbaked 10-inch pie shell. Mix eggs, margarine, sugar, flour, and vanilla together. Stir in chocolate chips and pecan pieces. Pour into 10-inch pie shell. Bake for 55 minutes to 1 hour. Serve with whipped topping or vanilla ice cream. Never stir in chocolate chips into warm melted margarine. They will melt, and you will have a completely different pie! 2 Responses to "Chocolate Chip Pie"
Lauren! You did not make chocolate chip PIE! omg, so amazing! This pie didn’t last 24 hours in our house!